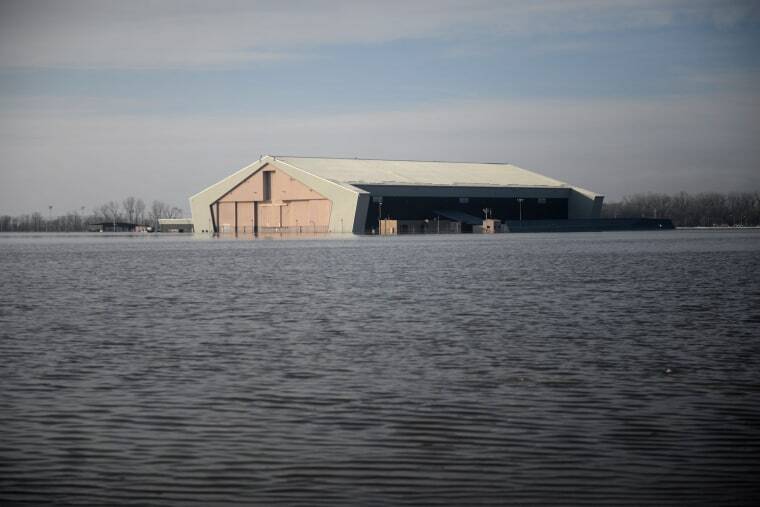 For several years, the United States military and federal and local officials knew that Offutt Air Force Base in Nebraska lay exposed to the threat of catastrophic flooding. But a key federal agency moved too slowly to approve plans to protect the base from last weekend’s deluge, which continues to cripple operations, a top local official said. The flooding submerged part of the airstrip and inundated dozens of buildings at one of the nation’s most important air bases. The calamity likely will cost many times more to repair than it would have cost to prevent, said the official, John Winkler, district general manager of the Papio-Missouri River Natural Resources District, the local government agency responsible for managing the section of the river nearest Offutt and Omaha. The damage has crippled the capabilities at an Air Force base that is home to the U.S. Strategic Command, which oversees the Pentagon's nuclear deterrence and global strike capabilities. The risks were long known, and were laid bare in 2011, when floodwaters crept to within 50 feet of the base’s runway. But while military officials in Washington and across the country have increasingly realized that their defense infrastructure is vulnerable to extreme weather that can be worsened by climate change, the response to protect Offutt and Omaha after the 2011 flood was agonizingly slow, Winkler said. Crucially, construction was never approved to begin reinforcing an earthwork levee system to protect the vital base from the Missouri River the next time it raged over its banks. Winkler said approval for the levee construction was complicated by myriad requirements from the Army Corps of Engineers that took six years to navigate. Approval from the Corps finally came last year. The district then approved construction bids earlier this year for work that will begin as soon as the floodwaters recede and the grounds dry, probably in May or June. Mike Glasch, deputy director of public affairs for the Corps’ Omaha District, said the agency could not talk about the permitting process because of litigation involving the levee project. Without the higher levees, Offutt lay vulnerable to the flooding that began late last week after an unusually intense cyclonic blizzard lashed the nation’s midsection. Heavy rain hit thick snowpack upstream from Offutt, which lies near the confluence of the Platte and Missouri rivers, sending a wave of water over the existing levees. The flooding submerged as much as a third of the base, closing down the runway and halting flight operations. “It’s going to be a long recovery,” the base commander, Col. Michael Manion, said Tuesday, speaking on video with floodwaters still surrounding the buildings behind him. All of the 10,000 base personnel have returned, though 3,000 have been assigned temporary quarters because their workplaces remain inaccessible. Water no longer covers the runway, but its return to operation is pending inspections, said Drew Nystrom, a base public affairs spokesman. The base has set up an emergency assistance center to help any Offutt personnel or families affected by the flood. So far, about 30 families have asked for help. It will be months, at least, before the base recovers fully and returns to normal operations, Nystrom said. He said key components of the fighter operations have been dispersed to other bases, where they remain ready to deploy if necessary. It’s too soon for scientists to assess the role of climate change in the latest storm and flooding. After the 2011 flood, a National Oceanic and Atmospheric Administration study said the storm probably fell within the range of natural variability. But the science of attributing natural events to climate change has advanced since then, and this flood was worse — the most catastrophic in a half century, according to Nebraska Gov. Pete Ricketts, a Republican. “The devastating flooding at Offutt Air Force Base demonstrates once again how critical it is to understand the climate vulnerabilities of our installations,” said John Conger, former assistant secretary of defense for energy, installations and environment under President Barack Obama and now director of the Center for Climate and Security, which studies the risks posed by climate change. At Offutt, the risks exposed by the 2011 flood were formally recognized in 2015. A land use management plan — carried out by officials representing the base, the city of Omaha, the natural resources district and various cities and counties protected by the levee — warned that the levee needed to be built up, and cautioned that climate change might make matters worse. In particular, FEMA had ordered 19 miles of levees along the Missouri to be raised by 2 feet to protect Offutt and portions of Omaha, including one of the city’s wastewater treatment facilities. “We didn’t have our head in the sand,” Winkler, the manager of the local natural resources district, said. But the levee improvements didn’t come in time for this month’s flood. Military experts say climate-related disasters — such as the flooding of the Missouri River, wildfires that have interrupted military training across the country and punishing heat that is sickening thousands of military personnel a year — must be taken into account as part of training and missions. “For the Department of Defense, the takeaway from this event has to be what lessons have been learned,” said retired Army Lt. Col. Frank Galgano, an associate professor in the Department of Geography and the Environment at Villanova University. The flood should be seen as a “window into the future,” when the potential loss of strategic bases such as Offutt and the Norfork Naval Station in Virginia to flooding would have consequences for the nation’s military preparedness, he said. “If this pattern persists, it may signal a larger problem,” Galgano said. Outside the gates of Offutt, flooding prompted evacuations in at least 23 of the state’s counties, according to Nebraska Emergency Management Agency officials. A $1.3 billion STRATCOM headquarters that opened on the base earlier this year was built on higher land and wasn't directly affected by the flooding. The building’s design, including being surrounded by a barrier to reduce flood risk, also recognized the urgency to prepare for climate-related natural disasters. In 2018, the Defense Department released a survey that highlighted the security risks climate change posed to more than 3,500 military installations. Non-storm surge flooding ranked third on the list of the most reported severe climate-related events. In 2018, the Defense Department released a survey that highlighted the security risks climate change posed to more than 3,500 military installations. A Pentagon report released to Congress earlier this year warned that climate change threatened key bases. “The effects of a changing climate are a national security issue with potential impacts to Department of Defense missions, operational plans, and installations,” the report said. However, in a table in the report listing the risks faced by each of the dozens of bases, Offutt did not report intermittent flooding as a risk. Critics in Congress said the report was inadequate. At Offutt, the focus now is on assessing the flood’s damage and ensuring the base is more prepared for the next big storm.